Now, there's to be no judging please, but for me the word biddy will always be inextricably associated with the Australian soap opera Neighbours. Yes, it would seem that in a rare lapse of standards and judgement, my Mother (who was an otherwise learned lady of refined tastes) at one time watched it in the late 80s. I, for my part, just stood back and watched. 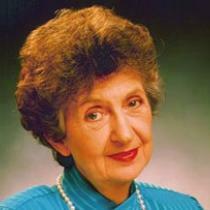 Anyway, Mrs Mangel is the archetypal biddy. In fact, the OED's definition does seem unusually broad as I've only ever heard biddy used to refer to a nosy and somewhat cantankerous old lady, which is of course always going to be derogatory. Neighbours seemed to use the word most liberally as a faux expletive whenever anyone dealt with Mrs Mangel who, interestingly, is regarded as one of the most convincing soap opera "villains" of all time. In fact, Vivean Gray, the actress that played her, eventually quit Neighbours because she was so sick of getting hate-mail and abuse from viewers (albeit incredibly stupid ones) that couldn't differentiate her real-life character to her on-screen one. Another interesting thing about the word biddy is that ... hang on a minute there, mate (cue stereotypical Australian accent) ... are you still thinking about the fact that I might have seen an episode of Neighbours or two in my youth? Stone the crows! If you're gonna keep bringing up that one little mistake every time I write a post you can just rack off! If you've ever let yourself and your family down by watching Australian soaps, of if you were one of those that sent Vivean Gray hate-mail for being an old biddy and think it was fair dinkum, do please leave a comment below. I've never watched Neighbours, but growing up in NZ, I heard, and used, 'nosy old biddy' often. It was never just 'biddy,' nor was it ever complimentary! All these years later, it still conjures up a picture of the old dear down the road peeking through her curtains!